Although born Anne Frances, she was always called Nancy. When Nancy was 14, she was adopted by her step-father and her name was legally changed to Nancy Davis. 1 California, Biographical Index Cards, 1781-1990, Record for spouse Ronald Reagan, Ancestry.com (Online Database). 2 Find A Grave, (accessed 10/14/2016). 3 Roberts, Gary Boyd, The Royal Descents of 600 Immigrants to the American Colonies or the United States , Baltimore: Genealogical Publishing Co. (2008), 491. 4 Roberts, Gary Boyd, comp., Ancestors of American Presidents , Boston: New England Historic Genealogical Society (2009), 175, 641. 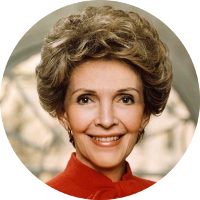 5 Wikipedia, "Nancy Reagan", (accessed 03/06/2013).